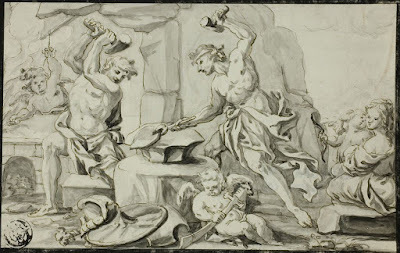 Vulcan Making Arms for Achilles, while Venus and Cupid Look On. Chronologically, this last story aligns nicely with the publication, in southern France, of a Latin book of alchemical recipes by royal physician Pierre-Jean Fabre (1588-1658). Contained in his volume is a prescription for a malleable form of glass, presumably the fabled vitrum flexile. Fabre's book was titled Palladium Spagyricum, 1624. Spagyricum is a reference to spagyrics, the specific brand of chemistry practiced by sixteenth century alchemist-physician Paracelsus. Palladium translates to 'protector' or 'savior'. As an aside, it is interesting to note that Fabre developed an elaborate philosophy which integrated chemistry as a 'sacrament' to Catholic theology, but that is a story for another day. I. Take oyl of Luna, twenty drachms: oyl of Mercury, or its water seven times rectified, one pound: mix them together and distill them. II. Repeat this distillation till the oleum Lunae rises with the water of Mercury in distillation. III. Distill this water again until it is fixed, and converted into a fixed oyl, and this repeat four times. IV. In the fourth time the oyl of Luna is fixed with the oyl of Mercury, so that they render glass malleable; for so great is the viscosity in your oyls, that it removes the brittleness of the glass, and so leaves it of a malleable temper. V. The reason is, because that the radical moisture of the glass is multiplied by the radical moisture of the metals. Which is plentiful and turgent or swelling in the oyls of Luna and Mercury. VI. And if [in] this oyl made volatile, diamonds should be dissolved, and then digested into a fixt oyl, it would transmute all glass into diamonds, only by projecting this oyl onto melted glass. VII. There are also other precious stones comprehended within this oyl, when it is made volatile, and digested, and fixed again by digestion continually for the space of a year. VIII. Also this oyl can turn glass into precious stones of any kind whatsoever, if therein (being made volatile) precious stones of the same kind have been dissolved, and digested with it into a fixed oyl. IX. For as metals are included in their fixed oyls: so are precious stones in theirs, as Raymundus Lullius doth witness in many places; the which thing we shall teach you in the following chapter. Elsewhere in the book, it is explained that 'oyl of Luna' is silver dissolved in acid, and 'oyl of Mercury' is a sublimation of mercury and saltpeter. From a purely technical standpoint, the formula is credible in that both mercury and silver were successfully used as additives to glass and they do integrate into the matrix. Notably, Antonio Neri used both of them in his chalcedony glass. In Neri's case he was using these metals to produce color, although he does not attribute a specific tint to these ingredients. Under some circumstances, silver is known to produce an attractive blue. It should also be noted that Renaissance glassmakers used similar silver-mercury formulas to produce a reflective layer on finished glass mirrors, in a process that resembled gilding. They formed what was known as "mercury glass." It is not beyond the pale to speculate that experiments would be conducted to add such concoctions directly to the glass melt. In the end, though, there is no indication that these additives would produce a malleable glass. As far as I am aware, this is the first example of a specific recipe for malleable glass uncovered in the literature. If nothing else, it is an important marker for further research into the history of glassmaking. Strabo: Geography, v. 8; Pliny: Naturalis Historia XXXVI.lxvi.195; Petronius: Satyricon 50.7; Also recounted by Casius Dio (c.150–235 CE): Historia Romana 57.21.7; Isidore of Seville (c. 560–636 CE): Etymologiae XVI.16.6, ‘De vitro’; Suetonius; Ibn Abd Alhokin; John of Sailsbury. Knolles, Grimstone, Johnson: Richard Knolles' The General Historie of the Turkes (London: Adam Islip, 1621). Neri 1697 (Introduction). 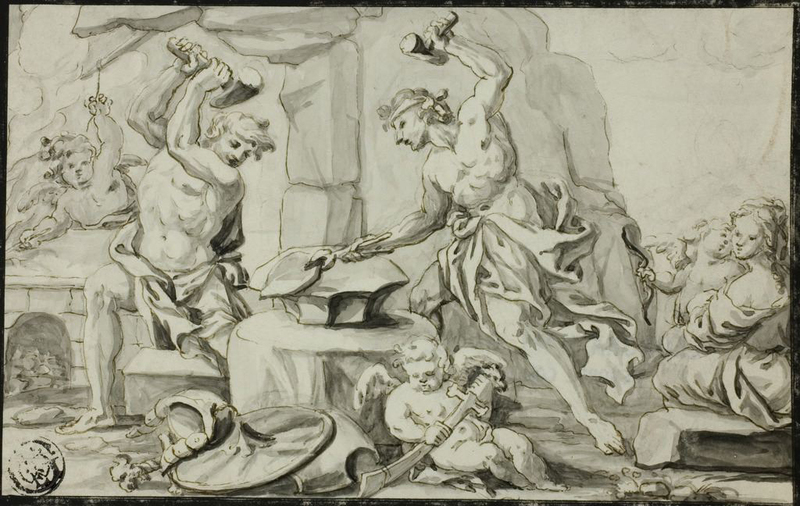 A French translation of Florentine glassmaker Antonio Neri’s 1612 book L’Arte Vetraria [The art of making glass] by Jean Haudicquer de Blancourt. Also see my earlier post here http://www.conciatore.org/2014/07/flexible-glass-reprise.html . Pierre-Jean Fabre: Palladium spagyricum Petri Ioannis Fabri doctoris medici Monspeliensis ... (Toulouse: Bosc, 1624), p. 276. Later translated into several English editions, see note . William Salmon: Polygraphice: Or the Arts of Drawing, Engraving, Etching, Limming, Painting … (London: T. Passenger & T. Sawbridge, 1685), pp. 598, 599. To more adventurous readers: DO NOT TRY THIS AT HOME, or anywhere else, ever. Vaporized mercury is a powerful neurotoxin. Small amounts can cause permanent brain damage and multiple organ failure. Furthermore, this recipe uses powerful acids and nitrates, which are extremely dangerous even in a controlled laboratory setting. Even if you have little regard for your own health and safety, consider those around you; this includes loved ones, family, children, pets, neighbors and the emergency workers who will inevitably be left to clean up your mess.